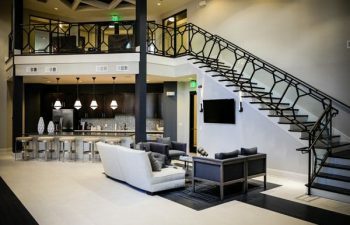 In Atlanta, a high-end apartment complex sought to create a modern, unique clubhouse environment for residents to enjoy. A central area for social gatherings and events with a business center, the clubhouse serves as the “front door” of the community and is key to attracting young professional tenants. The client aimed to provide the perfect blend of city living and the comforts of home, enhancing the space with a beautiful custom staircase system. With sophisticated details and a one-of-a-kind design, this custom commercial stairs project offers just the cutting-edge look the client envisioned. From inspiration to installation, our skilled and experienced team worked to bring the client’s unique vision to life. Our industry-leading design team collaborated with the client to create an innovative design; a modern space for both current and prospective residents to enjoy. The modern staircase with an eclectic wrought iron handrail system offers elements of urban life and the welcoming feeling of home. With the goal of creating a uniform flow and complementary style throughout the apartment clubhouse, the commercial stairs project did not end with this custom, modern staircase system. Our team leveraged our unique capabilities to design, construct and install a set of stunning sliding barn doors in the same style. 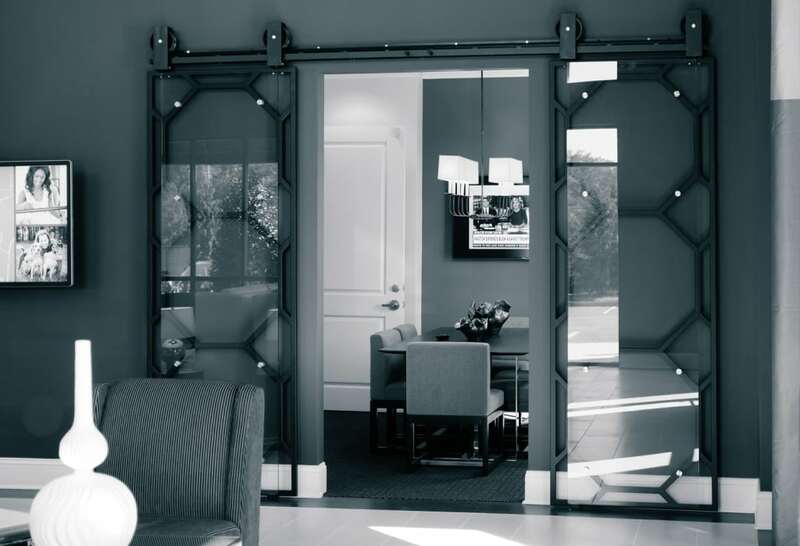 The doors feature the honeycomb wrought iron pattern coordinating with the handrail system, also accented with glass. The custom doors truly set the clubhouse space apart and showcase our team’s creativity and quality of work. While each client’s vision is unique, and our design and construction capabilities are endless, we ensure superior quality and seamless execution by following a proven process in each of our commercial stairs projects. Our turnkey approach to ornamental wrought iron projects begins in our state-of-the-art metal fabrication facility once the client approves all drawings and mockups. We are proud to employ a team of artisan welders, skilled old world craftsmen, who hand forge each piece of ornamental metal. Constructing the finest handrails and accent pieces, they make each project a one-of-a-kind work of art. In order to ensure a perfect fit and finish for each handrail, our team constructs and pre-fits ornamental handrails to the staircases before delivery and installation. This approach not only improves the fit, but it also prevents the need for welding at the jobsite, resulting in a seamless and mess-free installation for clients. Visit our commercial stairs gallery for additional details and pictures on our monumental projects. From inspiration to installation our team is committed to designing and building the highest quality commercial staircases and wrought iron handrail systems. Our reputation speaks for itself and client satisfaction is our highest priority. Contact us today to discuss your next commercial stairs project.